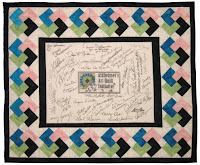 The autographs of 40 quilting luminaries are featured on this quilt, including wonderful quilting stars like: Alex Anderson, Sandy Bonsib, Libby Lehman, Ricky Tims, Laura Wasilowski, and Ami Sims. Created by Kathy Kennedy-Dennis of Houston, Texas, it is called "Tricky Cards" for both the block design and the hand of cards once is delt when one faces the uncertain future of Alzheimer's and related dementias. View it, bid on, it and check out the other signature quilts (including one by Barbara Bush) as they are auction companions of a host of lovely and creative quilts up for bidding and sale at the Alzheimer's Art Quilt Initiative. During the first 10 days of each month the AAQI has a “Slow & Silent” online auction. The June auction( featuring the 7 signature quilts among others) as well as the wonderful Spring Post Card Sale Buy a postcard (no bidding necessary) for a $30.00 donation to Alzheimer's Research. Later this month you can get in on a one-time auction of vintage quilts that will be offered from June 15 to 25! Donations of quilts are accepted throughout the year. Founder and Executive Director, Ami Simms hopes to take 1,000 of these Priority: Alzheimer’s Quilts (just 9″ x 12″ in size) to International Quilt Festival in Houston in October. Check out the rules and help this great cause. Thanks so much for spreading the word about what we're doing! Ciao! I'm an italian girl and I just find out your blog.. it's lovely!! !